A young Communist intellectual who fights against Trujillo. Dedé falls in love with him, but Virgilio has a romantic and intellectual relationship with Minerva before fleeing the country. A Dominican woman from the U.S. who finds Dedé to interview her about the butterflies. Patria’s husband, a simple farmer who is devoted to his ancestral land. He joins the resistance movement at Patria’s urging, and loses his land as a result. The official leader of the Fourteenth of June Movement and Minerva’s husband. Manolo is killed three years after Minerva. An engineer who delivers weapons to Minerva and then falls in love with and marries Mate. A girl whose family was killed by Trujillo. Minerva befriends her at the convent school, and they end up in prison together. She also goes by the nickname Sina. A beautiful girl at Minerva’s school whom Trujillo seduces, impregnates, and abandons. Patria’s son, who joins Minerva’s movement. Patria’s daughter, who avoids religion until the church is attacked by Trujillo. The Mirabals’ maid. After the butterflies’ deaths, Fela acts as a medium channeling their spirits. Minerva’s daughter, who becomes a professor and politician. A young priest who joins the resistance movement with Patria. A friendly man who drives the sisters when they are under house arrest, and is murdered alongside them. A captain of the SIM who keeps track of the sisters when they are under house arrest. He seems to simultaneously feel somewhat ashamed of his actions, to want the Mirabals to like him, and to have no trouble personally stealing their land. The “secretary of state” whose primary job is to find pretty girls for Trujillo. Papá’s illegitimate daughter who works at a pharmacy. The head of SIM. A violent, sadistic man who is fond of torturing others. A kind guard who smuggles things to Mate in prison. A girl who befriends Mate in prison and kisses her, much to Mate’s dismay. A selfish woman in prison. A nun at Minerva’s school who respects Minerva’s outspoken nature. One of Minerva’s closest friends at school. Another of Minerva’s close friends at school, Elsa goes on to the university and marries a journalist. María Teresa’s two friends at the convent school. María Teresa’s two cousins. She has a crush on both of them as a girl. A rebellious old man in trouble for refusing to hang a portrait of Trujillo. One of Minerva’s first revolutionary friends. A nun at the convent school who talks with Patria about her calling. A distributor for Papá’s store, Virgilio’s cousin. He takes Papá for questioning and propositions Minerva on Trujillo’s behalf. Trujillo’s right-hand man who questions Minerva. Mamá’s uncle, an old friend of Trujillo’s. Mate’s roommate at the university, a member of the underground. Patria’s last child, named after two Cuban revolutionaries. Jaimito’s mother, who adores Dedé. An old Spaniard who helps the sisters. A doctor and “political” whom Minerva visits. A “political” who updates Minerva on the revolution. A seemingly innocent young soldier who hitchhikes with the sisters on the day of their deaths, but seems ultimately to be a government plant. Dedé’s friend in 1994, who warns her about living in the past. Cosby, Matt. "In the Time of the Butterflies Characters." LitCharts. LitCharts LLC, 7 Sep 2014. Web. 18 Apr 2019. Cosby, Matt. 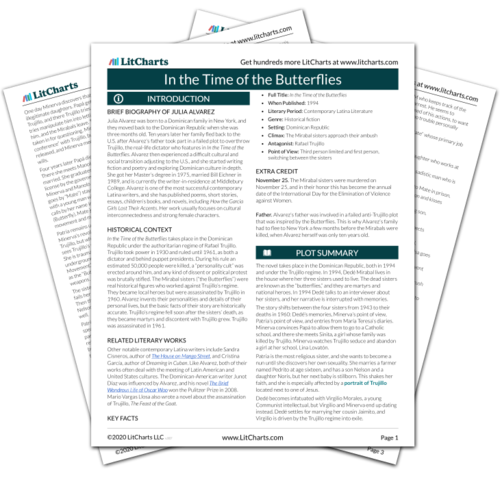 "In the Time of the Butterflies Characters." LitCharts LLC, September 7, 2014. 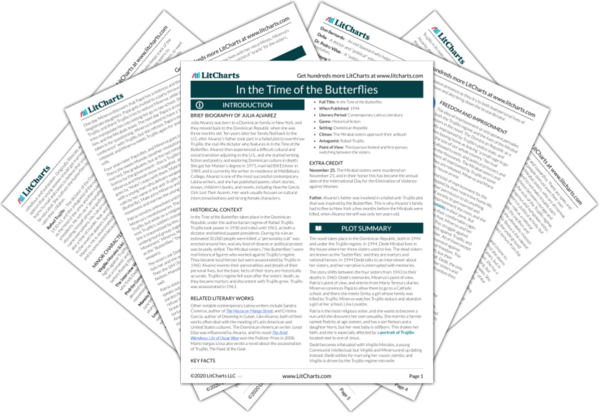 Retrieved April 18, 2019. https://www.litcharts.com/lit/in-the-time-of-the-butterflies/characters.